One evening in July 2015, my flatmates and I found ourselves all at home at the same time, for the first time since we'd moved house. We moved in the first week of July, and because these days everyone has multiple jobs and no spare time at all, we hadn't even found time to sit and eat dinner together since moving in. However, this particular Saturday night we decided to have a wild one. We pulled together everything our fridge and cupboards had to offer, made a meal out of mismatches, dusted off my projector screen and had an old school movie marathon (featuring movies so terrible they're brilliant). We were thinking about movie snacks before we'd even decided on dinner, but what is a movie marathon without some sweet thangs? Popcorn gets stuck in your teeth and is nutritionally substandard. Chocolate - dairy/sugar/emulsifiers. Raw Chocolate - good but slightly boring. Sweets - just no, not these days. Chewy Bliss Balls / Cookie Dough Bites - chewy, sweet and salty goodness with raw chocolate. 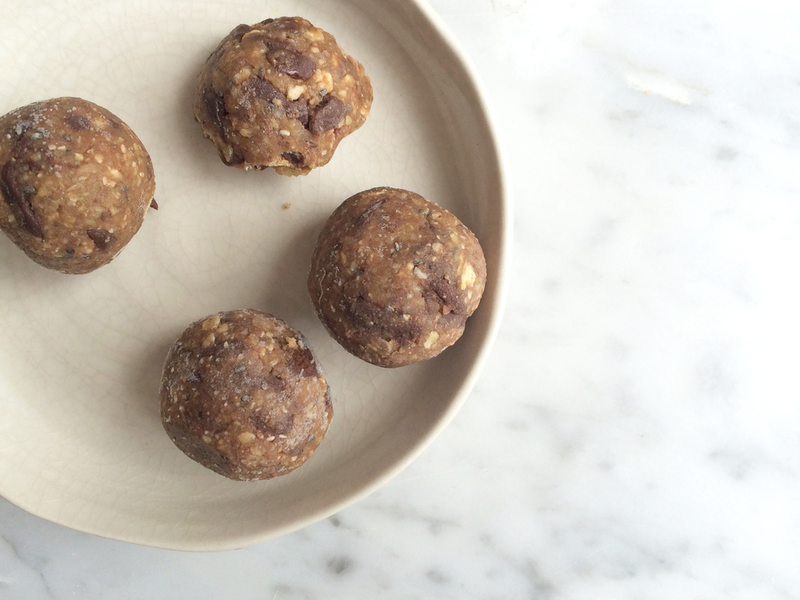 All natural, gluten, grain, dairy and sugar free, antioxidant, fibre and protein rich, and filling in a clean way. Well, that's just about the only way to christen a new home in my eyes, so thats exactly what we done. This recipe is just the kind of recipe we all need more of. It is quick. It is seriously inexplicably delicious. And I practically made it with my eyes shut. I was concentrating on dinner, catching up with my flat mates and thinking about what films we should watch, whilst the food processor did the hard work. I also didn't measure any of the ingredients thoroughly, and chucked in whatever I could find. This recipe, although I have more or less estimated the quantities that I used, should work just fine. 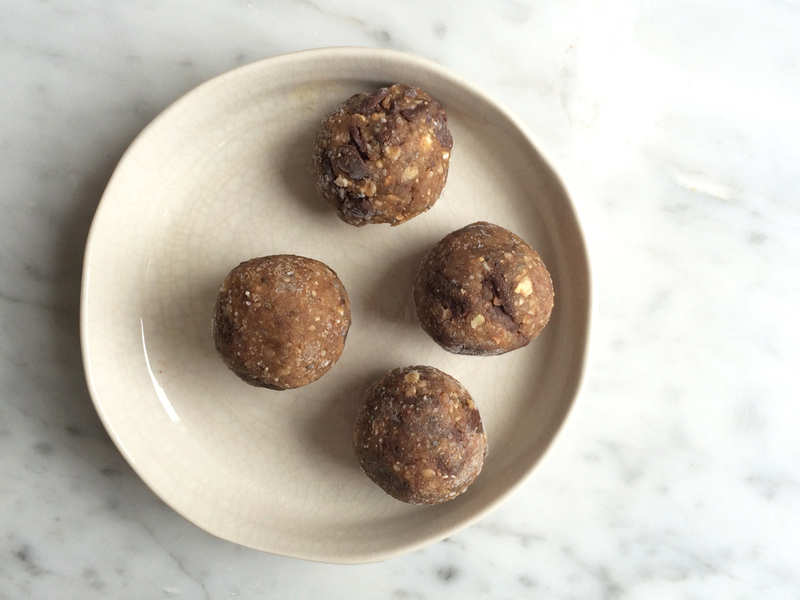 As long as you have the nuts and buckwheat flakes as the foundations, the dates and the coconut oil to bind and bring everything together, and the superfood powders to flavour, you'll end up with something delicious. The quantities only really alter the texture, not so much the flavour. So, if yours turn out too soft or wet, add more buckwheat flakes. If they turn out too sticky, and so stubborn they won't blend, add a little hot water. If they're too sweet, add extra lemon juice and/or salt/tamari. And if they're not sweet enough, add 1/2 or 1 date more. In my defence of this seeming like a lazy recipe (why don't I just try it again and give you the exact measurements? Sadly, I. Don't. Have. The. Time), even if I did have exact measurements, the end result may not suit your personal tastes. This way, you can take inspiration from my recipe and work with it until you have it just the way you want it. I'm here to encourage you to create your own delicious foods, by providing you with the foundations and leaving the flavourings up to you. We're all different, and not everybody, for example, likes raw chocolate (shame on you tho). Start by blending the nuts into a flour - usually takes around 1 full minute. Then add the buckwheat flakes and blend for another 30 seconds. Next, add the dates (halved), then the rest of the ingredients, apart from the raw chocolate. When fully combined and dough-like, transfer to a bowl and stir in the raw chocolate, kneading with you hands to combine (work quickly so the chocolate doesn't melt). Break the mixture into small chunks, roll into balls, flatten into bar shapes, or roll out gently and cut with shaped cutters to make raw cookies. Arrange on a baking tray or a plate and place in the freezer. Leave for 30 minutes, to 1 hour and remove 5 minutes before enjoying. I like mine straight from the freezer, and as they melt they become a fudgey consistency. If you prefer yours softer, leave them out for 10-15 minutes before enjoying. I'm sure you can work it out. + If yours seem too oily, wet, sticky, salty, sweet or lumpy, see above for directions. Despite the name, Juice Baby is by no means infantile. This place is more like the daddy of raw food, and with a menu I thought I would never find this side of the pond, it is so ahead of the game. Their Raw Pad Thai is like no other, their millionaire shortbreads are so nourishing it's like biting into a slice of happiness, and the chia seed pudding, with an abundance of homemade toppings, is Spot. On. And what I love about it most is how silently it has crept onto London's health food scene. The atmosphere is wonderful, and something I find really important in any kind of eatery, especially a healthy one. People can easily feel intimidated entering a health food store, feeling under educated or out of place if they aren't a regular juicer with a sturdy E3 shot schedule. But Juice Baby is calm, laid back and has beautiful interiors that don't make you feel on edge about spilling a little kale juice. This place could very easily be your best friends living room. Their menu is what sets this place apart from other health food jaunts across the UK. They've gone one step further than a few bliss balls and a box of courgetti, offering amazing sea kelp noodles and salads with vibrant, tasteful dressings, delicious chocolate treats, homemade nut milks, juices, smoothies and shots, and other snacks that fit perfectly into a busy lifestyle with little time to dedicate to cooking. They make salads instantly more delicious with simple dressings and dips, and their lunch boxes are full of a combination of ingredients, making them exciting and interesting, as opposed to plain, dry and limp-looking. They take traditional favourites like thai noodles and mexican chilli and rework them with natural, raw ingredients, brimming with life as well as flavour. The staff are lovely, the vibe is admirable, the owner is passionate and, although it feels like the other side of the world from where I live, it is definitely worth the journey. No noisy coffee machines, no loud chart shows, just calming interiors, chilled music and a lovely energy. Sit and enjoy their salads or order from their breakfast menu, or if you're in a rush, empty their fridges and fill your bags.